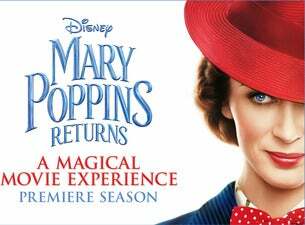 Experience the Premiere Season of Disney’s Mary Poppins Returns, a magical movie event at the Regent Theatre, Melbourne and State Theatre, Sydney before it opens in cinemas nationally. In this all new original musical and sequel, Mary Poppins is back to help the next generation of the Banks family find the joy and wonder missing in their lives. Emily Blunt stars as the practically-perfect nanny with unique magical skills who can turn any task into an unforgettable, fantastic adventure and Lin-Manuel Miranda plays her friend Jack, an optimistic street lamplighter who helps bring light—and life—to the streets of London.